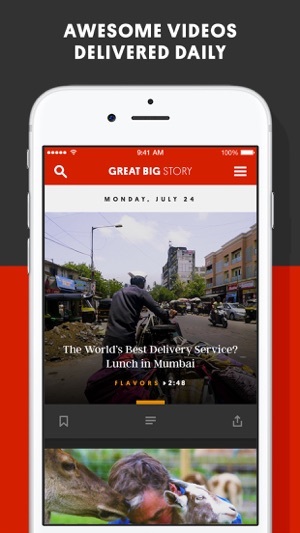 Great Big Story brings you awesome video storytelling from around the world. We are obsessed with the unexpected and the amazing. Starving for something cool and interesting? 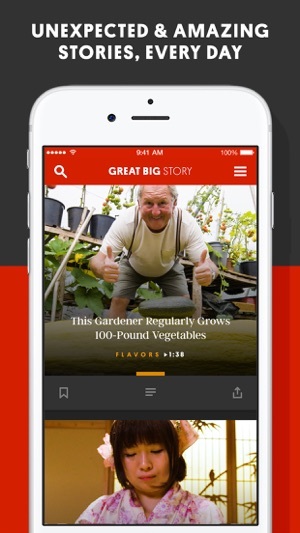 Snack on Great Big Story and you’ll feel completely full. 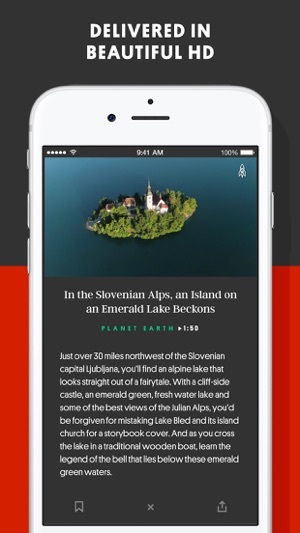 - Frontiers: See all the crazy places that imagination and technology can take us. - Human Condition: Humans are weirdmazing™ and capable of amazing things. Just watch. - Flavors: The coolest stories behind what we eat and drink around the world. - Planet Earth: The story of our incredible planet and the inspiring things people are doing to preserve it. - Origins: Where did it all begin? How were your favorite things and stories born? Your answers are here. We love a good movie, and we’ll marathon a show from start to finish—but sometimes we just want to watch something a little…different. That’s where Great Big Story comes in. This beautiful app features videos about food, nature, and extraordinary people—and it's as captivating as it is refreshing. I have never written a review on the app store but this app deserves my first one. 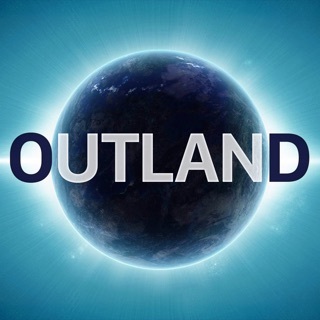 In a world where we are constantly on our phones mindlessly using social media, watching hours of shows on repeat, and where the news is always negative, this app showcases how beautiful the world really is. The simple and unique UI lets the audience enjoy a small 5-10 minute video, opening our eyes to a new culture in the crevices of this vast planet, new ideas, a humble yet innovative person, etc. I hope this app gets more attention since it will make people a little more open-minded and appreciative of the world we live in. I solidly enjoy the interface, haven’t experienced any bugs (I’m a veteran user) and the content gets an A+, especially if you are commuting or enjoying morning coffee. I show videos to people all the time and have created a following! Definitely worth a download, and I don't review apps often. 5 stars for me!